A car sat abandoned in storm surge along North Fort Lauderdale Beach Boulevard as Hurricane Irma hits the southern part of the state. ST. PETERSBURG, Fla. (AP) — As Irma marches up Florida’s Gulf Coast toward Tampa Bay, residents fear what the storm will do to an area that hasn’t taken a direct hit from a major hurricane since 1921. From punishing winds to catastrophic storm surge, the area is bracing for devastation. Vulnerable structures range from the towering Sunshine Skyway Bridge to toxic waste sites from the state’s phosphorous mining industry. A 2013 World Bank study that ranked cities according to their vulnerability to major storms placed Tampa at number seven — among all cities in the world. Irma was a Category 3 storm Sunday afternoon. Its center was on track to reach the Tampa Bay area by late Sunday or early Monday. The four-county area, with approximately 3 million residents, encompasses two of Florida’s largest cities: Tampa and St. Petersburg. The area is known for its sugar-sand beaches, the Busch Gardens theme park and the Salvador Dali Museum. Among the chief concerns is storm surge. A report released in June by CoreLogic, a global property information firm, said nearly 455,000 Tampa Bay homes could be damaged by hurricane storm surges, the most in any major metro area except Miami and New York City. And rebuilding all those homes could cost $80.6 billion, the report said. In 2016, the risk-management consultancy Karen Clark & Co. said Tampa Bay is the nation’s most vulnerable metro area to storm surge flooding caused by a once-in-century hurricane. The Boston-based firm said Tampa Bay acts as a ‘‘large funnel’’ for surges, forcing water into narrow channels and bayous with nowhere else to go. 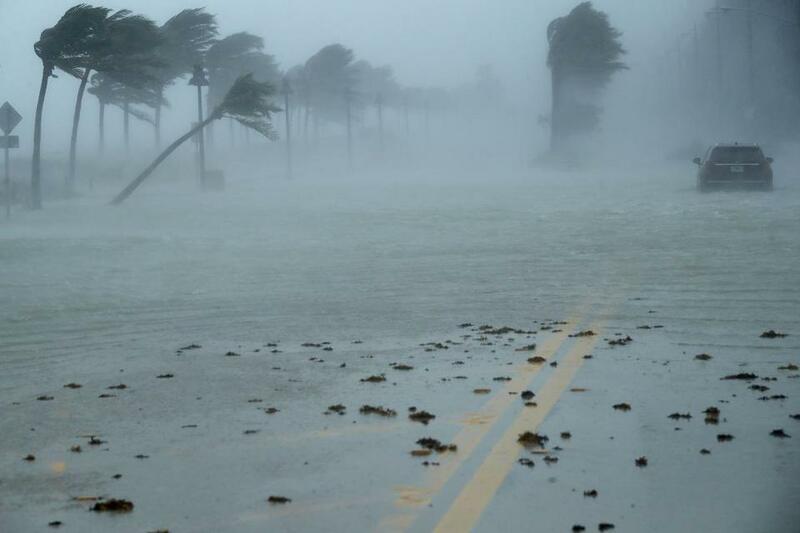 Officials in Tampa Bay studied a scenario eerily similar to Irma in a 2010 report that looked at what would happen if a Category 5 hurricane hit the area. To be sure, Irma is not that powerful, but it is the strongest storm to hit the area in decades. The 2010 report anticipated wind damage from a hypothetical Category 5 storm would destroy nearly half a million homes and businesses if it hit the coast near Tampa Bay. And while Irma differs from the storm modeled by the researchers, their report was an ominous foreshadowing. Storm surges can overwhelm area cities’ wastewater treatment plants, sending runoff into Tampa Bay. When Hurricane Hermine brushed past in September 2016, several municipalities released partially treated sewage into Tampa Bay because treatment plants ran out of capacity. Toxic waste sites in the Tampa Bay region also pose risks to public health if they are flooded or damaged. Florida has the nation’s largest phosphorus mining industry, and it’s based in the area. A byproduct of the industry is 27 hill-sized piles of waste containing low levels of radiation and other toxins, according to data from the U.S. Geological Survey. Some of the piles are 500 feet tall. Last year, a huge sinkhole opened up beneath one of these stacks, sending millions of gallons of contaminated mine wastewater into the Floridan Aquifer, a drinking water source for millions. The hole remained open for months until earlier this year when the owner, Mosaic, finally managed to create a preliminary seal. But the repairs are not finished and could be vulnerable to the storm. Mosaic spokeswoman Callie Neslund said in an email on Sunday the company has been working to complete repairs. She said a well meant to recover pollutants is working, along with back-up generators. ‘‘Our efforts to reinforce and strengthen the (sinkhole) seal are proving effective,’’ Neslund said. The region is also home to more than half of Florida’s 51 Superfund sites - areas designated as some of the most toxic places in the nation by the U.S. Environmental Protection Agency. Many are old chemical or oil storage facilities that left behind a legacy of dangerous contamination in soil and groundwater. State and federal government agencies have been working to clean them up for decades. Florida’s Department of Environmental Protection said it would be testing groundwater as soon as it’s safe to do so after the storm. EPA said it will also be on the ground after the storm.